I asked this question during a script-writing workshop for the film Planting for Peace (P4P)(US, 2010) that I directed. I was working with a team of ten Black and Latino youth during a year-long program where we were charged with making a film about sustainable food, urban gardens, and farmer's markets. The team’s prior projects had been dedicated to organizing campaigns against gang-related violence in the youths’ community, but they had almost no experience thinking about food in a sociopolitical context. Many had shared personal stories with me about their own involvement with gangs in which “someone they knew” got hurt or intimidated, explaining how that was what led them to enroll in this community leadership program that had brought us together. I was asking them to take these collective memories of their community, memories scarred with violence of various forms, and blend them with a new form of discourse about how they could remake their space by cultivating nutritious food. Even with our lessons about the social dimensions of food I was unsure of how they might respond. After a pause, David, a 16-year-old Puerto Rican teenager, spoke up: “To me it’s about what we put in the ground . . . we need to bury more seeds than we do bodies.” This phrase, “bury seeds, not bodies,” became the subtitle of the film. David’s framing of food issues was part of an active makeover of messages about nature that reminds us that soil is more than just a place to grow food; it is a place where too many young victims of street violence are buried. As an activist and researcher who works for youth empowerment through media production, I was inspired by how David infused social justice into his understanding of growing food. Recently, there has been an influx of media available about the importance of food, but so few have messages that portray David’s perspective on identity, space, and nature. We are inundated with new films, magazines, and television shows about healthy eating and the food system, but I have questioned how the food message is actually perceived by urban youth of color, and if it really nourishes their perspective. David’s community is a “food desert”—an area with almost no places to buy healthy foods at fair prices, combined with a high concentration of fast food. Media about food is similarly ubiquitous but malnourished with respect to themes of race, class, and urban space, themes that speak to the collective memories of those most affected. In making a film about food with urban youth of color, I would learn how we could grow some of our own nutritious media. To prepare the team for producing a film about food, the first part of the Planting for Peace program was spent going through a food literacy curriculum, which embraced the participants’ shared memories and perceptions of violence by studying food from a more militant angle. Imbuing food issues with questions of power, justice, and community resistance would better relate to urban youth collective memories regarding street violence. From a gang and violence perspective, urban space is viewed as a turf war, where there are numerous invisible borders that one can cross in the width of a couple blocks. This space is not just contested between gangs, but it is caught up in the tensions caused by larger demographic shifts that affect urban communities. Situated on the cusp of gentrification in their Boston neighborhood, the youth in this project were faced with a dwindling amount of space that was owned and run by the families in their community, as community-owned space was being replaced with health food stores and vegetarian eateries out of their price and palate range. I knew the youth habitually avoided these stores and the community gardens they walked by every day. Ironically, I also knew that these gardens had rich histories of political and militant struggle to keep their borders intact, and that people of color had often waged these battles to save their patch of green in an otherwise concrete space. The work we had to do would be to connect the same turf wars the youth created in their community space with the ones that had been used to keep the gardens alive. When gardening is presented as solely a health issue, its own collective memory that is loaded with pride in community land is erased. A more nutritious form of media, one that nourishes collective memories that view space as possibility and healing, rather than vacant dead ends and gravesites, was due. To recast growing food in a stronger power matrix, we watched films like Scott Hamilton Kennedy’s The Garden (US, 2008), which looks at the Latino South Central Farmers in Los Angeles and the fights they waged with the police and politicians when facing eviction. We learned about Guerilla Gardening, a covert way of greening urban space, or as Richard Reynolds, author of On Guerilla Gardening dubs it, “the illicit cultivation of someone else’s land.” We had workshops where we learned to make “seed bombs,” little balls of clay, soil and native wildflower seeds that can be thrown over fences into vacant lots to re-sow the local flora. We also delved into the national memory, learning about the World War II Victory Garden campaigns that framed growing food as a civil duty to help defend our country. “Every Garden a Munition Plant,” reads one of the posters we looked at in our lessons, solidifying a connection between militancy, fighting, and growing food. 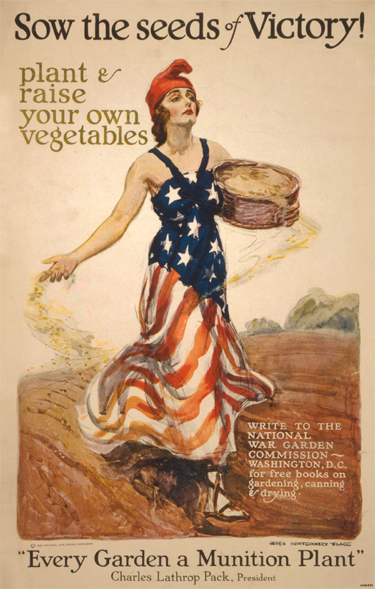 Another Victory Garden poster we studied and used in the film features a soldier talking to a gardener saying, “I see we’re fighting the war together.” I wanted to use media to show that food has been implicated in fights of all kinds, whether with a street soldier or a war soldier. By integrating this type of media into an educational program, we were able to access the collective memory of street violence harbored by the youth and have them see that the connection to growing food was not new or contrived, but pre-existing. Like the true embattled history of the community gardens, we did not need to come up with new ways of saying that food was important for identity, pride and authenticity; we needed to remember it. The second half of the P4P project was putting cameras into the hands of the youth and learning how to make a film, to make more nutritious media of our own. Throughout the project we had the opportunity to grow two raised beds next to their building, matching our cultivation of media with the cultivation of the small four by eight foot spaces for food. This type of activity, where youth are engaged in media production to “see, question, and act” for themselves, is what Whang and Waters call Media Action Projects (MAPs). I prefer to call them Action Media Projects, AMPs, because that is what they are supposed to do: to amplify an otherwise bland commentary on the world’s problems and to ideally get the audience fired up (“amped,” in urban youth slang). In the P4P project we learned every aspect of media production, from videography, to still photography, to basic graphic design and editing. We had someone filming during all of our workshops and whenever we gardened on the raised beds. Gathering footage also involved touring the gardens and farmers markets in other parts of the city where we interviewed youth farm workers working with food-based, non-profit organizations. This process took much longer than it would have if I had just taken the footage myself, but the result was that the interviews are youth talking to youth, and their conversations feel much more organic than if they had been asked by an adult. The trailer for the P4P film provides an example of how the youth pitched their message to intertwine issues of food and violence: see below and http://www.ejmedia.org/p4p. Planting For Peace: Bury Seeds, Not Bodies from Mike EJAM on Vimeo. Through the food and digital literacy education, the Planting for Peace project allowed us to see how space, in this case the raised bed gardens, could act as a conduit to deep-seated collective memories about violence and redemption. By growing food in the wooden boxes and simultaneously producing a film about our actions we were able to unearth powerful messages about how urbanized youth connect their own wounded conceptions of life and identity to the soil and nature. Like recalling difficult memories, it was a challenging process, and by no means an easy harvest. As one participant said, “To be honest, at first I asked myself how is a wooden box, dirt, and some seeds going to get us anywhere?” It would have been simpler to have the youth spewing canned lines like “I love vegetables and eating healthy,” but they captured a rockier journey as they first grappled with the actual sweat and labor it takes to grow food. “I thought they were nasty at first,” one youth remarked about the vegetables he grew. By making a space where youth were allowed to recount their stories of violence and connect those stories to a more positive way of relating to their land and space via sustainable agriculture, we produced a narrative about healing. Near the end of the film they narrated, “What we put into the Earth matters, and we’re tired of burying our friends,” as we see one of them transplanting a seedling into the raised bed. By recognizing the connection between space, memory, and media, the homegrown and action-based cultivation of the Planting for Peace film became more nutritious. Among the more insidious problems with current industrial and corporatized farming practices are the terminator seeds: seeds that are genetically modified to be sterile. Farmers who purchase these seeds must return to the vendor every year if they want to have a new crop. In this model, growers lose their freedom by paying high prices to do what used to be done for free by sharing and saving seeds from their own plants. Today, this practice is frowned upon by corporations who view seed saving and sharing as eroding their profits, and in some cases go so far as to make this practice illegal. As I reflect on my own role in the Planting for Peace project, I think of how much I learned by opening up film production opportunities to the team of youth with whom I was working. I can see that this idea is similar to sharing seeds, where I, as the media expert, seek to enable the community I am working with to make more of its own stories. This step, in which documentary filmmakers make media with rather than for marginalized youth, is a pedagogical measure that allows a more nuanced exploration of cultural and physical spaces. This role in which the documentarian acts as a facilitator and teacher of skills, as opposed to an expert, is being harnessed by nonprofit groups interested in youth empowerment and environmental sustainability. One example of such a group is the New York based Guerilla Griots, who call themselves “sustainable storytellers who challenge the status quo.” They draw upon the idea of a Griot (Gree-oh), a West African storyteller, to describe their role as “traditional story tellers, modern media makers, connecting past to future.” The youth tech collective works on documenting action-based projects ranging from installing gardens at local schools to retrofitting Diesel buses. These groups exemplify the shift from passive consumption of mass media to active production. Their stance towards media in an age of mass production is analogous to the stance towards growing food held by the sustainable urban agriculture movement: the more homegrown the better. The P4P project is unique because we actively decolonized both urban space and urban collective memories. There were many structured educational activities that helped make the most of this project but it was the unexpected parts that held the greatest meaning and implication for redemption. One weekend when I was away I returned to find two signs posted on the raised beds. Created by our resident graffiti artist, the signs read “HOPE” and “FAITH,” and showed how the youth had found a more optimistic stance toward the garden boxes and the soil within them. One youth from another garden across town also brought his food-induced optimism up in an interview, saying, “To have a garden in East Boston, where like everything is going around, it’s like a small piece of hope saying yeah y’know even if we’re urban we can still have these things like suburbs, and also it shows that we’re doing this change for the Earth.” For this young man, notions of upward mobility, inequality, freedom, and the American dream were intertwined with his working of the soil. Whether articulating freedom from international enemies, local gangs, or just the freedom to commune with nature in a small raised bed, such comments demonstrate the spawning of powerful new memories about what gardening and food justice represent. Putting this young man in front of the camera helped encode this memory for him, the youth recording him, and me. In a time where an increasing amount of attention is being given to the centralization of power in our media and in our industrialized food system, it is critical that initiatives address the intersection of these issues. In his 1991 essay, “Can Poetry Matter?” published in Atlantic Magazine, Dana Gioia connects how we produce media (poetry) with how we produce food, observing, “Like subsidized farming that grows food no one wants, a poetry industry has been created to serve the interests of the producers and not the consumers. And in the process the integrity of the art has been betrayed.” Just as food loses nutrition in mass produced forms, media loses integrity and fidelity to the people whose stories are portrayed. Movements that promote independent and open-source media and those for sustainable urban agriculture have individually provided more nutritious alternatives via locally-produced empowering forms. The Planting for Peace project shows that these can be addressed simultaneously and, like the Guerilla Griots and other emerging groups, may spark future synergies between how we take back our space, how we teach our youth, and how we reclaim our own media production. Gardens, fruits and vegetables are like “frozen music,” write Peter Wilson and Bill Weinberg in Avant Gardening, bridging the value and beauty of media with that of food. By blending my song of growing vegetables and the urban youth’s song of stopping violence, we brought together two powerful voices for the practice of freedom. Richard Reynolds, On Guerrilla Gardening: A Handbook for Gardening Without Boundaries (New York: Bloomsbury, 2008). P.A. Whang and G.A. Waters, “Transformational Spaces in Teacher Education: Map(ing) a Pedagogy Linked to a Practice of Freedom,” Journal of Teacher Education 52 (2001): 197. Christopher Leonard, “Soybean-Seed Lawsuits Pit Farmers Against Biotechnology Companies.” Columbia Daily Tribune, 5 April 2000, Organic Consumers Association, organicconsumers.org/Monsanto/farmerssued.cfm. Peter Lamborn Wilson and Bill Wienberg, eds., Avant Gardening: Ecological Struggle in the City & the World (New York: Autonomedia, 1999). Michael Cermak is the founder and director of Environmental Justice Action Media (EJAM) an organization dedicated to producing youth-focused media about urban environmental issues. He is also a Sociologist and teacher at Boston College, currently completing his PhD on the role of hip hop and the arts in urban environmental education.